It's not a very practical variation, being virtually impossible to lead and follow socially as described, but it's a fun challenge. * It is, however, referenced in an 1889 newspaper article as a dance being taught in Los Angeles. It's also included (as an option) in a 1901 sequence dance by Isidore Sampson called The Sylph. She does the first half of a Glide Polka (a.k.a. 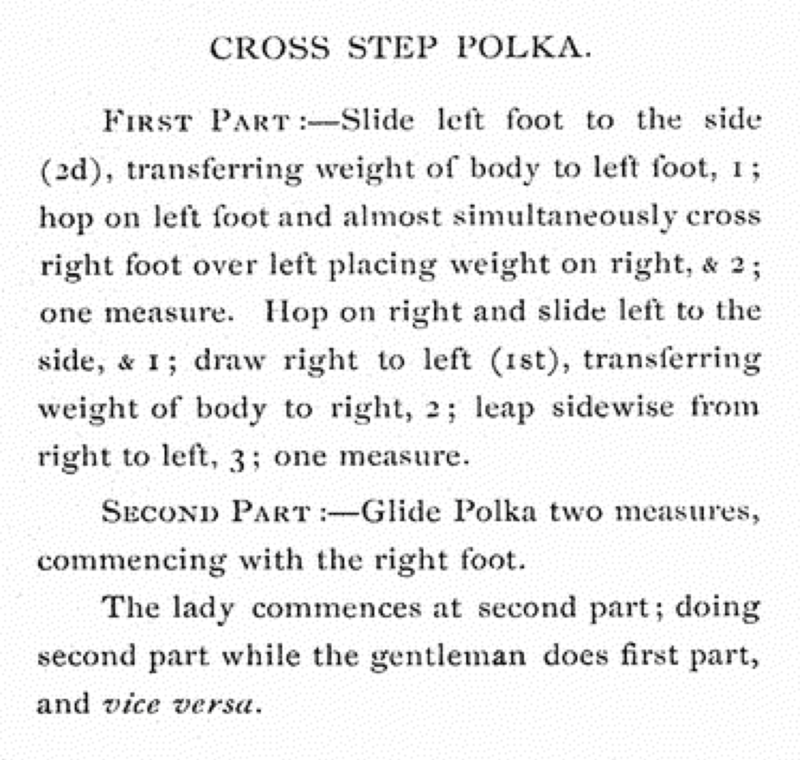 Four-Slide Galop) (1-and-2-and-3-and-4) while he dances: step (1), hop (and), cross (2), hop (and), polka (3-and-4), turning halfway around together on count 4. Then she does the cross-step part while he does a Four-Slide Galop (5, 6, 7, 8) [MG90]. While this "he goes, she goes" structure is clearly specified by Gilbert ("The lady commences at second part; doing second part while the gentleman does first part, and vice versa"), the 1998 Library of Congress reconstruction introduced another creative possibility: that both partners do the cross-step part together (which, coincidentally, makes the whole variation much easier to lead and follow).